It is a shrubby perennial that grows 3-7 feet tall. 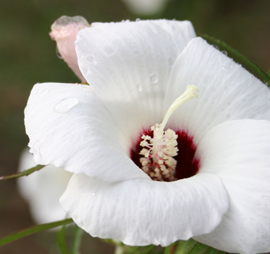 Like other Hibiscus, the Neches River rose-mallow produces large, showy flowers. Each blossom is 3 to 6 inches wide with five 2-to-4-inch-long creamy-white petals and a deep red or purple center. The plant generally blooms from June to September. The flower grows in wetland areas exposed to open sun. Occupied sites typically hold standing water for much of the growing season and are generally within the immediate floodplains of rivers, or adjacent to ponds, sloughs, and oxbows. Unfortunately, habitat loss and degradation have reduced the plant to just a few small areas that support no more than a few thousand individuals. The Neches River rose-mallow is present in four Texas counties: Cherokee, Houston, Harrison, and Trinity. Most remaining plants grow at four sites on the Davy Crockett National Forest. The U.S. Fish and Wildlife Service first designated the Neches River rose-mallow as a candidate for protection under the Endangered Species Act in 1980. This rare Texas flower must compete with Chinese tallow, a nonnative tree species, for space, light, and nutrients. 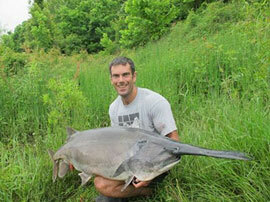 Its wetland habitat is threatened by development and stream channelization. Herbicides are a danger to 7 of the existing 11 populations. Climate change is expected to alter habitat conditions for the plant, and drought is already affecting habitat quality and reproductive success. Further conservation efforts will be required to save this lovely blossom from extinction. Get the East Texas Woods and Waters Foundation newsletter direct to your inbox. Don't worry, we promise not to spam you and we won't give your details to anyone else. The Mineola Nature Preserve on the Sabine River encompasses 2,911 acres located in Wood County, and is home to many East Texas species of critters that can fly, swim, walk, crawl, or slither. What began as a group of friends who liked to hunt and fish, in 1994 evolved into one of East Texas' most-recognized philanthropic foundations. The East Texas Woods & Waters Foundation welcomes your support - both financial and physical - without the burden of membership. Learn more here.